The 2D and 3D views are the center of the activities when you work with a map. They have a number of features that make working with them very comfortable and straightforward. In order to familiarize yourself with the material in this section quickly, we recommended that you try it out and reproduce it with one of the example maps that come with Cafu. Use the File → Open… menu for loading a map from the DeathMatch/Maps directory, e.g. Kidney.cmap. By default, the main window is divided into three views that show your map from different sides and perspectives. 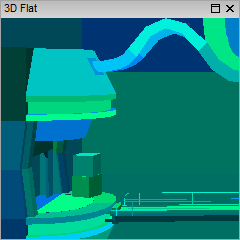 In the center is the 3D view, which shows the map as a perspective rendering. 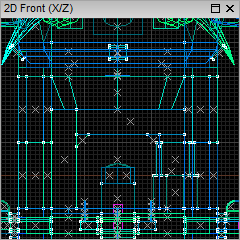 The two 2D views show the map from the top and from the side like an architects plan. Each view is a window whose title bar indicates the type and render mode of the view. You can maximize, minimize or close each view window with the buttons in the upper right corner. 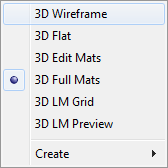 In order to create a new 2D or 3D view, choose View → New 2D view or View → New 3D view from the main menu. By clicking and dragging a windows title bar, the views can be docked, undocked and arranged as you like. Press Ctrl while dragging a window in order to keep it floating (prevent it from docking to one of the highlighted dock positions). A view is activated when you move the mouse pointer into its window. Keyboard input, menu commands and status bar information all refer to the most recently activated view. For example, if you want to navigate the views with the keyboard as presented below, just move the mouse pointer into the desired view window, and all keyboard input will be directed to it. or the context menu (right mouse button click). Note that render mode “3D Edit Mats” often looks much like “3D Full Mats”, but whereas the latter shows the materials in their “natural” appearance (as in the game engine, e.g. translucent, distorted, invisible, black, etc. 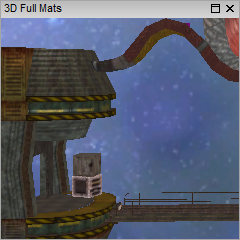 ), “3D Edit Mats” shows plainly textured surfaces instead. This can be very helpful for seeing the materials properly for editing purposes. Arrow keys ←↑↓→ Scroll the map into the direction of the arrow. Space Pan the view: while the key is being held down, scroll the map by moving the mouse. + or - Zoom in or out (on mouse pointer). 1, 2, 3, …, 0 Zoom to a preset level. 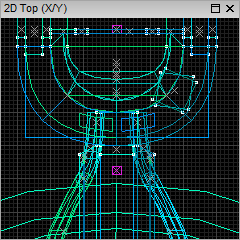 Ctrl+E Center all 2D views onto the currently selected object(s). Z Toggle the pan feature: Pressing Z once is like holding down RMB or Space all the time. Pressing Z anew turns panning off again. Tab Cycle through top, front or side view modes as described above (Shift+Tab for opposite order). RMB (click) Open the context menu (or apply a tool-specific function). RMB (drag) Pan the view: while the button is being held down, scroll the map by moving the mouse. Wheel Zoom in or out (on mouse pointer). In the status bar at the bottom of the screen you will see both the current position of the mouse pointer in world coordinates as well as the current zoom level of the active view. The currently active tool may provide additional information in the status bar as well. Arrow keys ←↑↓→ Rotate the camera (look around). W, A, S, D Move the camera left/right and forwards/backwards (along its depth axis). Space An alternative to the RMB that works exactly alike, including all combinations of Shift and Ctrl. Z Toggle camera control: Pressing Z once is like holding down RMB or Space all the time. Pressing Z anew turns camera control off again. Tab Cycle through the render modes as described above (Shift+Tab for opposite order). 1, 2 Advanced: Move the far clip plane closer to or farther from the camera. RMB (drag) Rotate: Move the mouse to rotate the camera (look around). RMB+Shift Pan: Move the mouse to pan the camera left/right and up/down. RMB+Ctrl Fly: Move the mouse to pan the camera left/right and move it forwards/backwards. 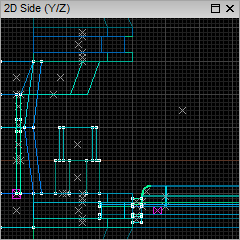 RMB+Ctrl+Shift Walk: Move the mouse to rotate and move the camera in the XY-plane. MMB (drag) Orbit around the point under the mouse pointer (horizontally and vertically). MMB+Shift Orbit, and move the camera closer to or farther from the object under the mouse pointer. Wheel “Zoom” (move the camera closer to or farther from the object under the mouse pointer). Combine with Ctrl or Shift for slower (but more precise) movement. Combine with Ctrl and Shift for even slower (but even more precise) movement. Except for opening the context menu, which requires a RMB click, the mouse buttons RMB and MMB must be pressed and held while the mouse is moved to control the camera. You can use the Camera Tool for more exotic (and less frequently needed) camera control features, such as creating additional cameras or setting the camera origin and orientation in a 2D view. 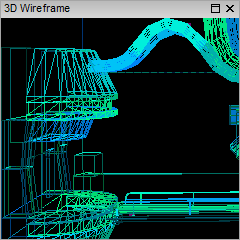 The Configure CaWE dialog has options that affect the 3D views and their cameras, e.g. for setting the movement speed or reversing the mouse Y-axis.